Candlewick Press and Net Galley allowed me to read this book for review (thank you). It has been published and is available now. 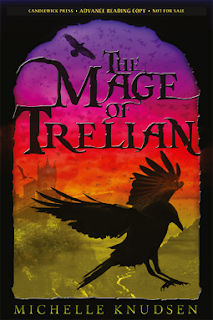 The problem Calen has is that while he wants to get away from the mage who is controlling, he's also learning about magic and how much power he has. He wants to learn more but he'd like to get away from the mage who hurts him if he's displeased. Then he finds out there is a plot by this superior mage to take over the world. That's even more devastating. All his friends will be dead! Back home, Princess Meg is in training for war duties with her dragon. She loves her dragon and he would do anything for her. She's practicing picking up "wounded" soldiers and transporting them and various war techniques. It's a good thing because war is upon them. This is a time of sacrifices on all sides. Anybody who doesn't do what the mage wants gets killed. The soldiers defending the castle are dying. And Calen finally manages to get away. But how do you defeat a mage who has already returned from death once? There's lots of action, new friends made, old friends found again and an epic battle at the end. With magic, dragons and lost love, this makes for a very good read.